Sold by Votones and Fulfilled by Amazon. Gift-wrap available. 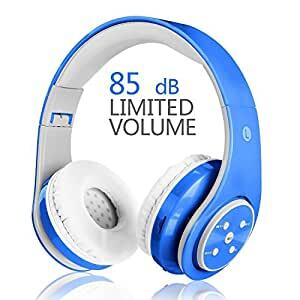 Amazon's Choice for "kids headphones"
♬ LIMITED VOLUME 85 dB & PROTECT YOUR KIDS HEARING: The limited volume 85 db to control, set you free without worries about your kids listen too long and hurts their ears. 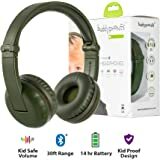 ♬ STEREO QUALITY SOUND & NOISE-CANCELLATION: This kids wireless headphones with stereo surround and also isolated the outside voice, which perfect equalized to meet your best music experience. Let your kids dance with the music. ♬ 3 IN 1 WAY: Support Bluetooth/ 1.5m Aux-in Cable music streaming/ TF Card. When the Bluetooth Mode and TF Mode need to turn on the Switching(ON/OFF)button first. The Line-in Mode do not need turn on the Button and even you could use during it have not battery. ♬ UNIQUE COLLAPSIBLE DESIGN: The adjustable headband can perfect fit to the shape of your head, it is perfect for 4~16 years old. And soft ear cushions support long wear without stress, fit for growing kids even adults. Easy to carry and save spaces wherever you go. ♬ GREAT GIFT FOR YOUR KIDS: Excellent gift for upcoming festivals,including Halloween,Christmas,also a good idea for toddler,children or grand-kids' birthday gift. Provide your kids the ultimate shared listening experience - enjoy music! 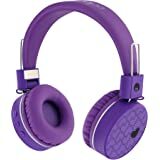 Adult sound quality with Cute Design! 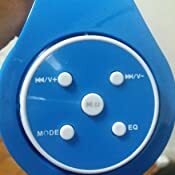 LED indicator light, toddler bluetooth headphones with Mic, Play/Pause, Prev/Next, Answer/Hang up calls by one button in bluetooth model Not wired model. The use of soft ear pads and high quality plastic provide great comfort without tighten. 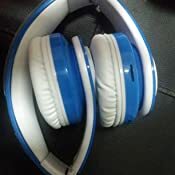 The two combine make the headphones comfort for long listening. Listening music - no more tangled cables, earplugs slipping out of ears or ear pain due to uncomfortable ear pads - a perfect design. This Bluetooth Headphone be connected by 2 easy steps. And it can be quickly paired with any of your bluetooth enabled devices. So you can spend more time enjoying music, less time on your device. *All Votones product are enjoy 30-days 100% Money-back Guarantee & 12-months Quality Warranty. *Friendly and easy to contact customer service with 24 hours for any problem. Buy with confidence! 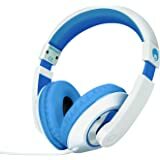 I bought these bluetooth headphones for my nephew who is a music lover, it always bothered his parents about his addiction for music, they were worried about the afteraffect of high volume and continous use. 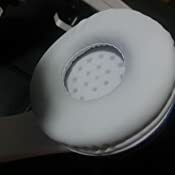 These headphones has light wieght with soft earpad and it also has 85 decibels which is prefect for long exposure of sound. 85 db level is the sound intensity level that is recommended by the world health organization (who) for the kids. My nephew also loved his present as these are foldable , soft and light weighted. Bought my baby this for our overseas trip. The color is hot pink, eye catching, which is why most of the flight attendants noticed it. My baby looked more cute wearing this. I love how this headphone can fold, doesn’t occupy to much space in my baby’s nappy bag. The volume didn’t go too loud and the sound was clear. The controls are easy to operate and the charge use was long. 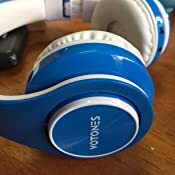 My baby had a peaceful and fun plane travel, thanks to this headphone. She just slept, listening to music. 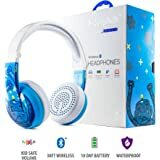 Good quality earphones for the little ones, play some of their music or YouTube clips and they can be occupied for the next 20-30mins giving you some peace or time to complete your chores. My little one really enjoyed it and carry’s it with him everywhere he goes.. 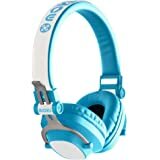 The headphones are light weight and comfortable for kids. Sits well on my daughters head with the adjustable feature. Very convenient for me to operate the music for my baby. Its fold able so easy to fit inside the bag. Also, has great looks and good sound quality. Perfect for little kids. The Battery also lasts for descent amount of time. These are good for the kids, although they do have a tendencies to slide of the front of our 3 year old's head. Our 5 year old son has no problem.